Around the oval Piazza del Popolo, one of Rome's most famous square, are many interesting sights, such as the twin churches and the city gate. 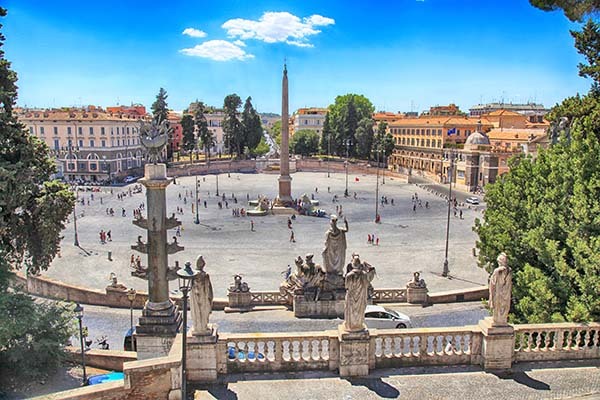 Piazza del Popolo is a very well-known square in Rome. In Italian the name means ‘People's Square’, but the name is actually derived from the poplars that surrounded the oval square. 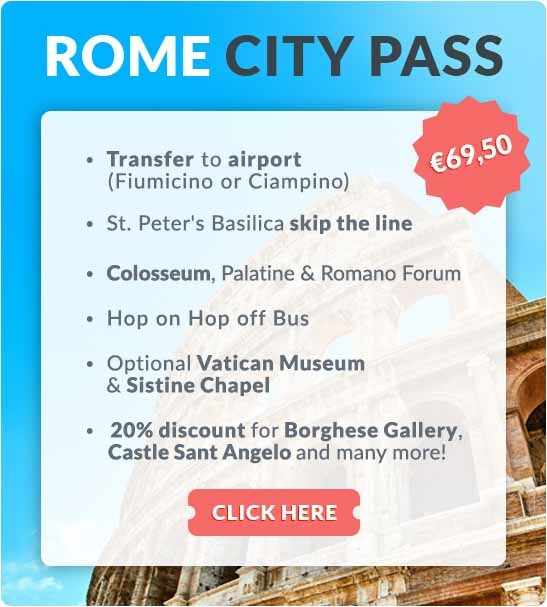 The original function of the neo-classical square, which was designed between 1811 and 1822, was welcoming visitors and pilgrims who entered Rome from the north over the Via Flaminia. Two unique buildings on the square are the almost identical baroque churches Santa Maria dei Miracoli and Santa Maria in Montesanto. They lie opposite each other, separated by the Via del Corso. On the other side of the square is the Basilica Santa Maria del Popolo. 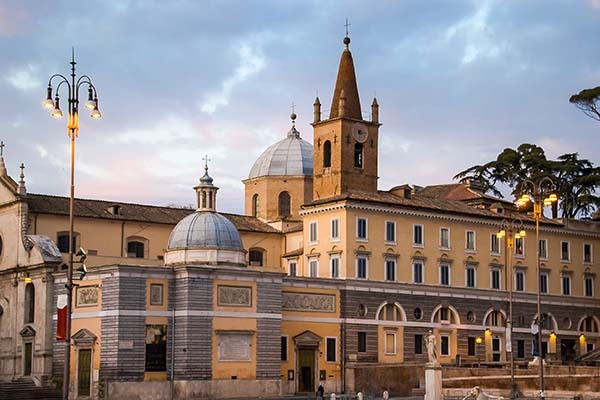 The main attraction of this church are the 12 side chapels, such as the Cerasi chapel with paintings by Caravattio; the ‘conversion of Paul’ and the ‘crucifixion of Peter’. 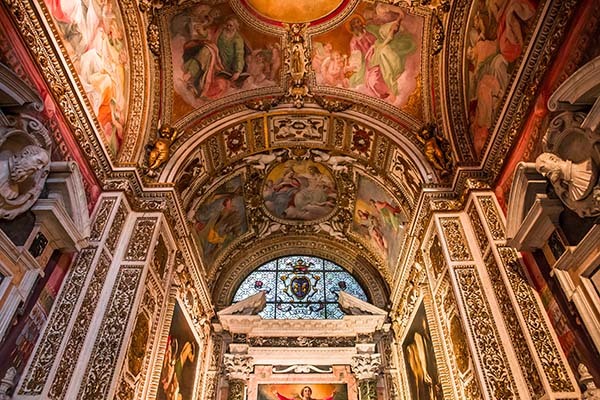 The Chigi chapel with mosaics representing creation were designed by Raphael. 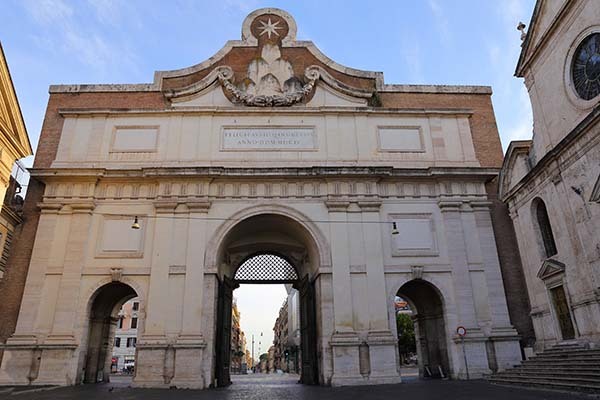 The city gate of the Aurelian Walls lies next to the church, the ‘Porta del Popolo’. The city gate was built in 1561 and designed by architect Nanni di Baccio Bigio. The inside of the gate was later decorated further by Bernini to celebrate the visit of the Swedish queen Christina. A fountain was built into the side walls on both sides of the square. The Fontana del Nettuno shows Neptune accompanied by tritons. The Fontana della dea di Roma focuses on the goddess of Rome. At its base stands the statue of Remus and Romulus (the founders of Rome) suckling at the wolf's teats. One of the most remarkable sights on this square is the 36-metre high Egyptian obelisk. The obelisk from 1300 BCE originally came from the Sun Temple of Heliopolis and was then taken to Rome by emperor Augustus to be displayed at the Circus Maximus. The obelisk was restored in 1589 and moved to this square by order of pope Sixtus V.
You can climb Pincio hill using the steps. Once at the top, the balcony of the Piazza Napoleone offers a magnificent view of the square and Rome. 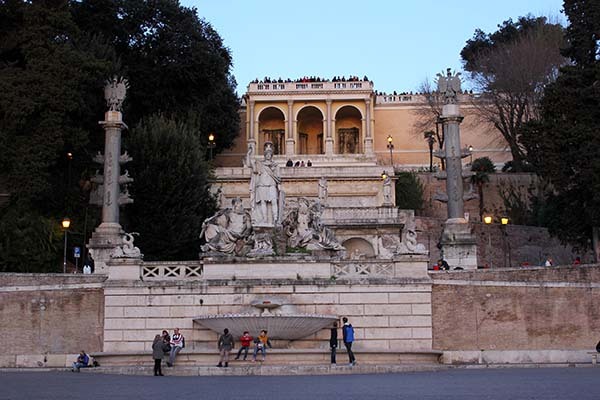 A short walk from there, you can find Rome's largest public park, ‘Villa Borghese’. 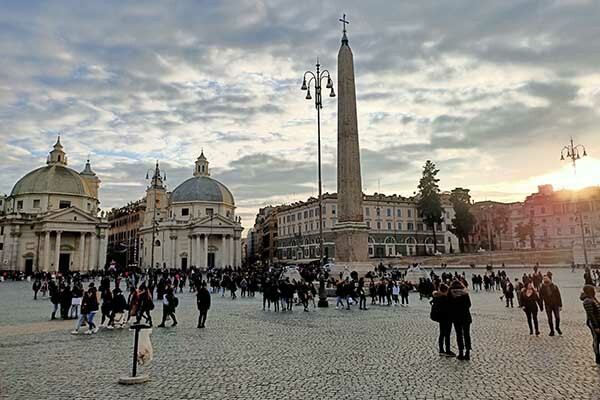 Where is Plaza del Popolo located in Rome?